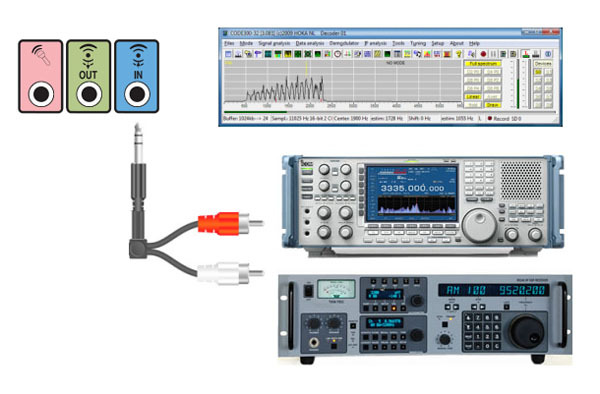 CODE300-32 Standard is a software solution to demodulate, decode and analyze digital signals transmitted via radio. Our software don't requires special hrdware part for processing the signal. The audio signal can come from traditional receivers and handled with a common soud card already included on all PC and Notebook, SDR receivers, signal recorded and stored in a standard audio file, it is also possible to use audio signals from the LAN, signals in I/Q format, and digital audio signals from virtual soundcard. Real Multitasking: open as many decoding modules and tools as necessary at the same time. No Hardware required: you only need the sound card of your pc, nothing more! Multi-Channel:use both channels L and R of any sound device to enable completely independent decoding from two different audio sources. Hard disk Recording: simultaneously with any decoding module. Fully Remote controllable by TCPIP: via Intra- and Inter Net. Up to 256 decoders controllable from one place. Felexible solution: due to the software-only solution, any notebook with a sound input becomes a super decoder analyzer. CODE300-32 is a software based demodulator, decoder, and analyzer which runs under all actual Microsoft Windows operating systems. This program is part of a new generation of data decoder analysers and follows the well known DOS based decoders CODE3. The program uses the integrated sound device(s) availabe on all modern PC while running under Windows as the AD/DA device. The software does not need an expansion slot nor any dedicated hardware to work. This solution is the most flexible way to use the decoder on any PC or notebook. Some of the modern sound devices offer very good performance when compared with industrial AD cards. So in our opinion the PC with its cheap but very good hardware is the ideal solution for a modern state of the art data decoder analyser. CODE300-32 keeps our long experience with software based DSP, every module, analysis or decoding, is completely independent and can be used stand-alone. This offers a complete new world in utility decoding. The program uses the soundcards left input channel as its main source but any additional module can be switched to the other input channel or remain listening to the main input. This allows the decoder to run multiple modules from two independent sources.As an example a MORSE decoder is running together with a SITOR decoder on left channel audio input to enable decoding both types of traffic without a switching gap or manually users handling. The second channel input decodes a VHF PAGER system like POCSAG at the same time. But you might miss a FLEX message, no problem open a FLEX module too and select the right input source. While any module is open the main FFT window is always running for tuning control and signal checking.